In this collection the listener finds the sounds of piano, synthesizers, percussion, Wurlitzer, organ, and voice, all performed by Lawalrée. Using these tools Dominique creates miniature themes that gallop across the speakers in slow motion, stretching our normal sense of dynamics and color, effortlessly widening the stereo plane. On “Musique Satieerique,” Dominique pays homage to the influence of Satie with simple repeated piano figures and a lush field of organs and flutes. And on other selections, like “La Maison Des 5 Elements,” he takes a more wistful, ambient approach, layering keyboard lines, and invoking found/tape sounds to create a hypnogogic world of his own. Childlike in its playfulness and surreal to the bone, the music spins like a carrousel placed inside the Rothko Chapel. Lawalrée’s sense of timbre, tone, and overarching composition is like an impression of a home movie whose charm lies in its knowledge of intimacy, shared by few. An incantation of innocence. "a quiet, understated music that is both touching and elegant"
"what is most affecting is the feeling of parabolic calm that can emerge from this music, ascending gradually. It's atypically devoid of New-age cliché, closer somehow to a secular revelation than to any protracted or consensus bliss." 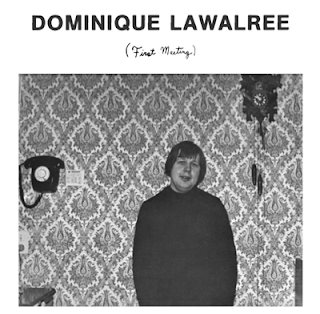 "Part of the charm of Lawalrée's work, and perhaps why he never broke through into broader consciousness, was the obliquely personal nature of his albums, which sometimes felt like improvised sound diaries, or like incremental explorations of deeply indivualistic themes… A beautiful rediscovery." "Harold Budd is an obvious reference point, but Lawalrée's brilliantly economical music eschews the grand, systematising ambitions of most minimalist music, and has a tactility and sense of particular time and place that places it closer to Angelo Badalamenti, Popol Vuh's Hosianna Mantra, or even Broadcast. This may be the first meeting, but hopefully not the last."